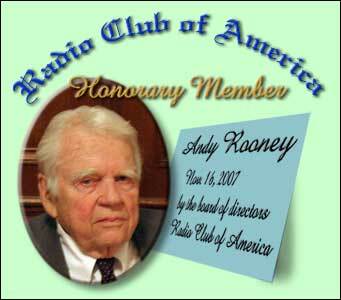 RCA has only three honorary members, including Andy. His CBS colleague, Walter Cronkite, was made an honorary member in July 2007. June P. Poppele joined the Club in 1981 and was made an honorary member the same year. June is a member of RCA’s Executive Committee and is chairman of the Club’s Good & Welfare Committee. Poppele family members have been active supporters of RCA activities for decades. The only other individual selected for honorary membership during the past 25 years was the late Mildred Link, widow of RCA’s perennial president — as he called himself — the late Fred M. Link. Mrs. Link was made an honorary member in 1998, shortly after Fred passed away. Altogether, RCA has had 28 honorary members. John V.L. Hogan, Robert H. Marriott and John Stone Stone were among the first, becoming honorary members in 1915, when RCA was but six years old. You would have to be interested in RCA history specifically or radio history in general or both to recognize those names today. Briefly, they were among founders of the Institute of Radio Engineers in 1912 and had extensive technical achievements. Hogan started a New York radio station that became WQXR. In February 1907, Stone founded a radio communications society that pre-dated the Radio Club: the Society of Wireless Telegraph Engineers. He was president of IRE in 1915. The Radio Club lobbied President Calvin Coolidge to appoint Marriott as an initial commissioner of the Federal Radio Commission when it was being assembled in 1926, to begin operations in 1927. Coolidge didn’t. That was back in the days when a more homogeneous membership made it easier for RCA to take positions on regulatory and legislative matters. If you click on the links to read these honorary members’ biographies, be advised that the link to information about Marriott downloads a PDF that is about 1 Mb in size, a slow download if your Internet connection is dial-up. This entry was posted on Tuesday, December 18th, 2007 at 1:58 am and is filed under RCA news. You can follow any responses to this entry through the RSS 2.0 feed. You can leave a response, or trackback from your own site.